It’s a New Year! I want to take a moment to thank you—my customers, my friends—for your support and your encouragement. 2017 was a difficult year for me, but I trust that 2018 will be much better! Here at the shop, we have some exciting events and classes scheduled to begin this month. We will be rolling out our 2018 UFO club this Saturday! It is always an exciting and popular event. Our class roster is filling out nicely, with both Quilting 101 for beginners and Quilting 201 for intermediates. Also, we are pleased to introduce Janet Humphrey as a new instructor, and we are looking forward to the launch of our new Tucker University! Please continue reading for more details! I want to encourage each of you to commit to taking a class (or three!) this year. Participate in a Sit and Sew. Each of us will benefit from the knowledge gained, and from the friendships formed! UFO CLUB 2018 begins January 6, 9:00 a.m.
Do you have piles of unfinished fabric objects (UFO’s) lying around? If so, join us on the first Saturday of January, at 9 am, and prepare yourself for a treat! Our club challenges you to shoot down your UFO’s one chunk at a time! Call for more details, or just come to that first meeting with a list of 12 projects (or parts of bigger projects) that you would like to finish in 2018! Participation is free, and door prizes are given at each meeting. Call for more info. Congratulations to all who finished all 12 of their projects last year and to our 3 - 100$ winners.. 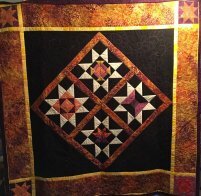 This class is to teach a quilt as you go technique. You can use this method on blocks you’ve already pieced or start from scratch and let your “Wonky” side out!In the first class I will be teaching the Ribbon Star and the Kindred Pinwheel. You can use these blocks in any way you would like in your quilt, or not at all. 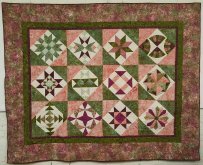 We will also be touching on the actual quilt as you go method.In the second class we will be learning the quilt-as-you-go method and quilting the blocks.In the third class, we will be putting the blocks together- either block to block or with sashing. Then we will put the back on.I think you will find this class interesting. If you haven’t done “Wonky” you will find it not as hard as you think. It will free your creative side and open a new avenue for your quilting.I’m looking forward to seeing you in class. Cost: $50, includes tool and instructional guides used. Fabric and basic sewing supplies not included. Trust me gals, this is the ONLY way you want to make a Lone Star quilt. There is NO cutting diamonds and NO Y seams!! 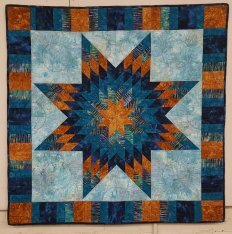 You can choose the 38” or 58” star.With the QuiltSmart foundation, your points will all match, and the panels go together as smooth as silk.This is an all-day class, and you will have at least ¼ of the star done by the end of class. Join Denise as she walks you through the fundamentals of quilting—from choosing fabrics to cutting, to accurate piecing, to quilting, to binding. You will be making a sampler quilt, with each block featuring a new technique. Graduates of this class can then confidently tackle any quilting project! This is a 10-week class. Take your piecing skills to the next level! So, you’ve learned the basics, now it’s time to tackle more difficult techniques, including, but not limited to: curves, paper piecing, applique, and templates. Carol Thurston will guide you through each technique as you gain skills and confidence! This is an eight-week class. Thursday evenings, beginning February 15, 2018 through April 5th, from 5:30-8:30 each night. February 3, 2018 is Quilts of Valor National Sew Day The mission of the Quilts of Valor Foundation is to cover all combat service members and veterans touched by war with comforting and healing Quilts of Valor. The Golden Quilts of Valor group and the Golden Threads Quilt and Sew Shop are opening up the event to three days – February 2-4, 2018. The event will be held at the Trenton Community Center. The hours will be 8-6 on Friday/Saturday and 8-4 on Sunday. We are asking people to come prepared to sew. Pack your sewing supplies as you would for a retreat (specific packing list will be available upon request). If you are already working on a QOV quilt, please bring to sew on if you choose. However, the Golden Quilts of Valor group are working hard to have kits ready to sew – major cutting already completed. Just pick up a kit, head for your sewing machine, put the pedal to the floor and let the thread/bobbins roll. If you don’t sew, this is okay. We always can use help pressing to the dark side. If you don’t sew or just have a few minutes you can drop by and see our progress. If you have any questions or want to join in on the fun, please don’t hesitate to contact the Golden Threads Quilt and Sew Quilt Shop at 270-466-5000 or text Nancy Beecher at 931-542-8589 with your questions and your name. Watch future newsletters for dates and details on SEWING classes taught by Denise Shivers!! ROSABELLE’S BOUTIQUE: If you haven’t yet visited this charming shop, you really must! This amazing little boutique features gorgeous clothing for ladies of all sizes, trendy shoes, fashionable jewelry, darling kids’ clothes, Melissa & Doug toys, and unique gifts for any occasion. So much fun under one roof! Look for more details on the fashion show December 1st. THE WOODEN NEEDLE:Besides Machine quilting, they have a huge selection of purses, scarves, gifts, etc., that can be personalized with a name or monogram of your choice. And, of course, they have the best selection of yarn around! Check out their Facebook page for updates. Come by to meet the owner of Trenton"s new Salon, Kaley Smith.This is a three chair salon which includes nail care. Currently there are two open chairs and room for a nail technician. If you are a stylist or nail tech who is looking for a wonderful place to work, set your own hours, have potential for a large clientele, this is the place for YOU!! Call Kaley at 270-604-5584. YESTERYEAR ANTIQUES —Located right in the heart of Trenton sits an amazing treasure trove of antiques and collectibles. Take your time browsing its huge selection, and make sure to visit the back room! Closed Sundays and Mondays. SCHLABACH’S BAKERY—Just a short drive (less than 10 minutes) from Trenton is Schlabach’s Bakery, a Mennonite bakery featuring homemade breads, pies, cakes, cookies, jellies, and cinnamon rolls. Plus, my favorites—Fried pies or whoopie pies! It is worth your time! Closed Thursdays and the entire month of January.